Doing what you love is always exciting, especially when you feel there’s always room for growth. 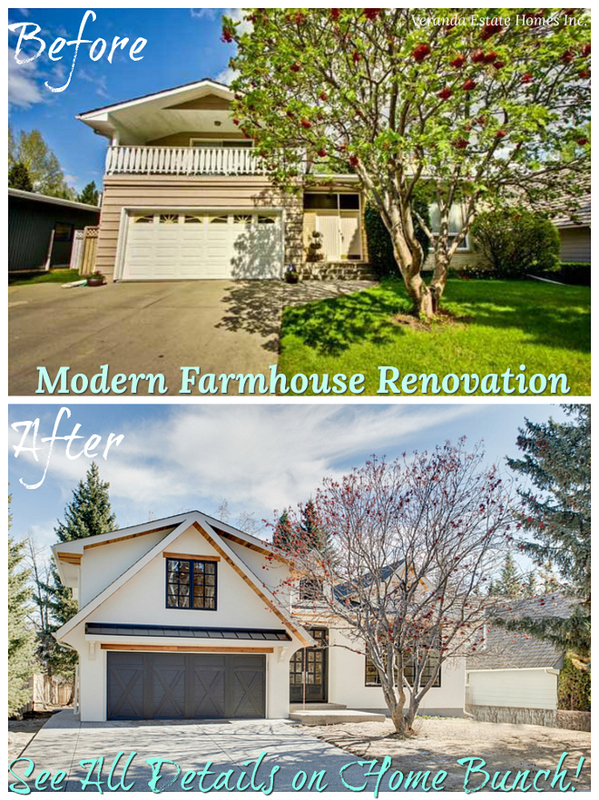 That’s exactly what happened to me while following Sonja from jshomedesign – a homeowner that just finished building her home and shares many pictures on her Instagram page. 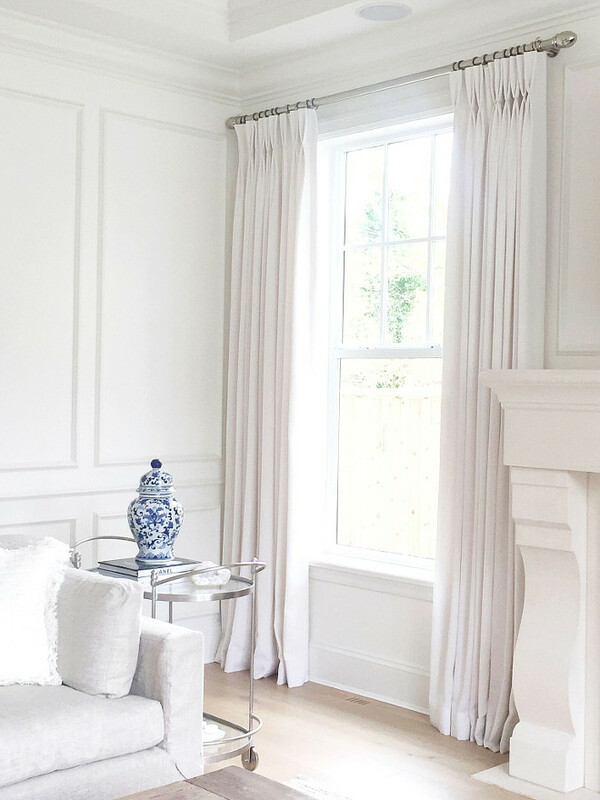 I follow many interior design pages on Instagram and I love sharing photos on my own page as well, but seeing Sonja taking care of her home, sharing all of the details and reading all of the comments always complementing her style made me discover an incredible world of talented homeowners that love to share their homes on Instagram. 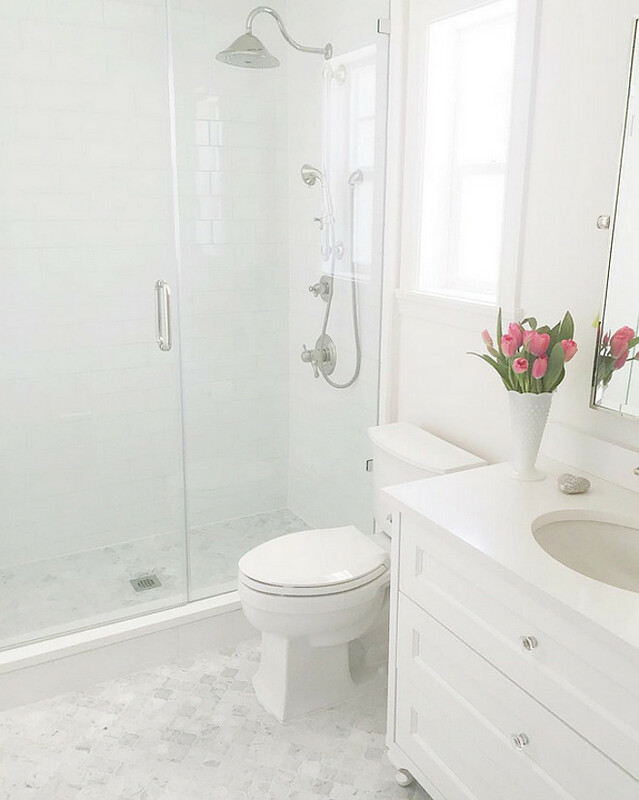 This inspired me to start a bi-monthly series where I will showcase beautiful Instagram homes designed by homeowners, like yourself. I am sure you guys will love to get to know more about these homeowners and see how they designed their interiors. “My kids were going to a private school which was about 35 mins away from where we lived. I was so tired of driving all the time so we decided to move closer to the school. We were in that house for about a year and were not liking the neighborhood and my husband’s commute to work was long. Plus, the school had no community feel and it was beginning to be a bad fit for my kids. My husband and his business partner wanted to move their office location to downtown Vancouver. 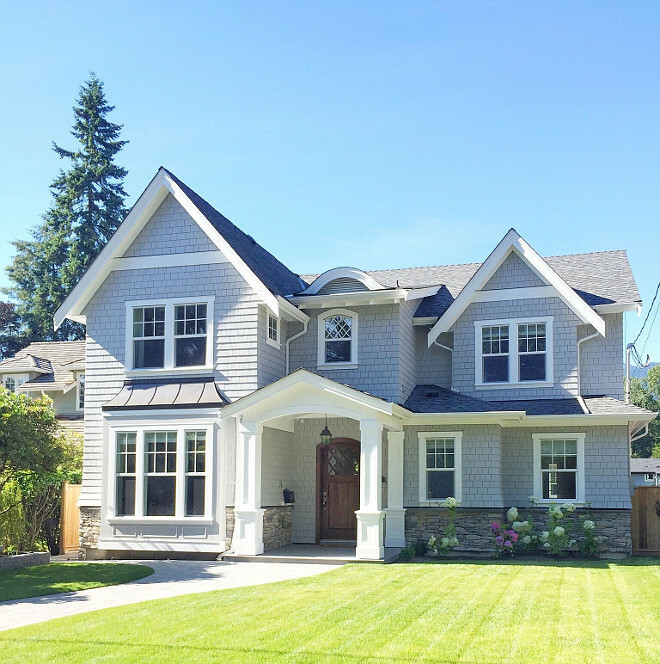 His partner was already living in North Vancouver and we adored his neighborhood. We loved this neighborhood as they have a moms and men’s group that met up monthly. Plus, a Facebook page for keeping in touch. There are always neighborhood events going on. We also have a corner stone bistro right in our neighborhood which is so quaint. It really is hard to find a neighborhood like this nowadays. The community is so tight here and so many young families with kids. My husband’s friend/business partner convinced us to move. His dad also agreed to build our house for us! One week later we had our house up for sale and left on vacation. While on vacation we sold our house! A month and a half later we moved and rented an apartment in North Vancouver. We always knew we wanted to be in the same neighborhood as my husband’s business partner. Another huge reason for moving was that we wanted our kids to be in a public school and to be able to walk to school and to be a part of the community. We did look at other neighborhoods but kept coming back to this one. We waited for 5 months until a property came up for sale that we liked. We bought it and started to build soon after. I quickly dove into planning out every single room and detail. I spent hours and hours finding every single piece of hardware, faucets, lighting, tiles. It was a full time job! I was always at the house planning out millwork, ceiling details, you name it. Every cabinet and vanity was drawn out by me and I had my cabinet guys make it. I did hire a designer but I wanted to take it in my direction and that’s what I did besides selecting a few tiles that were suggested. I never thought or planned about the house getting this much attention. I just simply did what I liked and while it was stressful, I really enjoyed it at the same time. I looked to Su Casa Design to design our home. 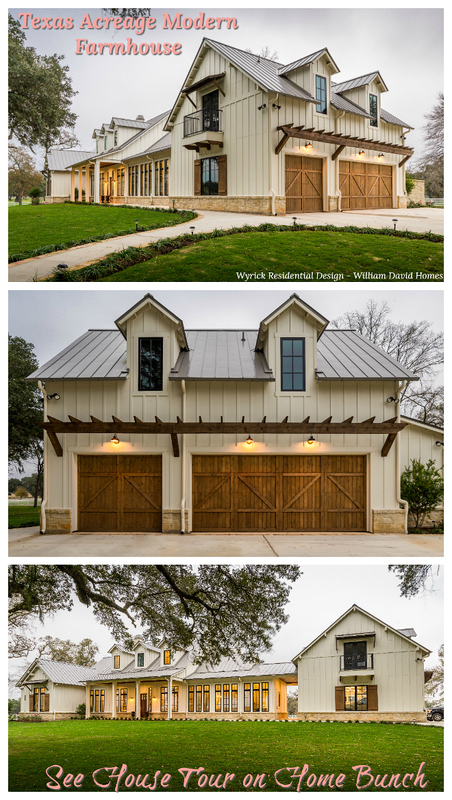 I had seen his work from a local builder and had to use him. 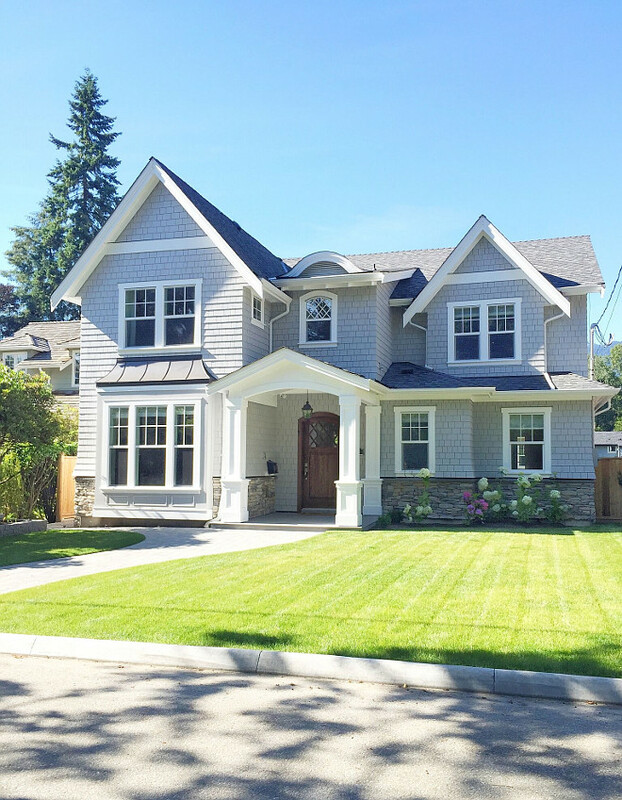 I wanted a character craftsman style home that goes with our neighborhood. 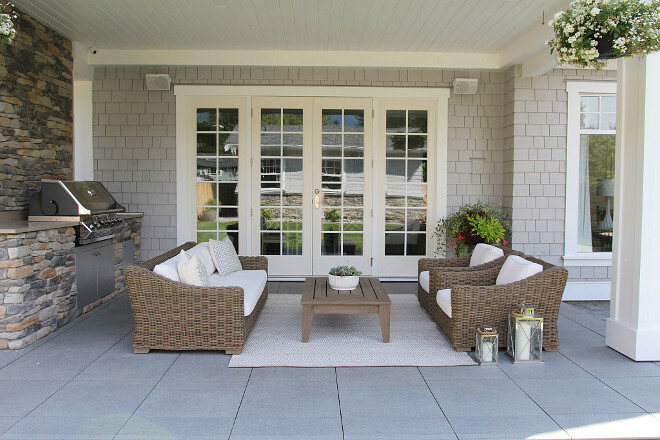 When planning out the design of our home we wanted an open concept that flowed right out onto the patio. We wanted one that would be great for entertaining. For the ceilings I put tongue and groove starting from the kitchen right out to the patio. It all flows and looks really nice. We changed the ceiling up to a coffered ceiling in the family room to make it look somewhat separated. 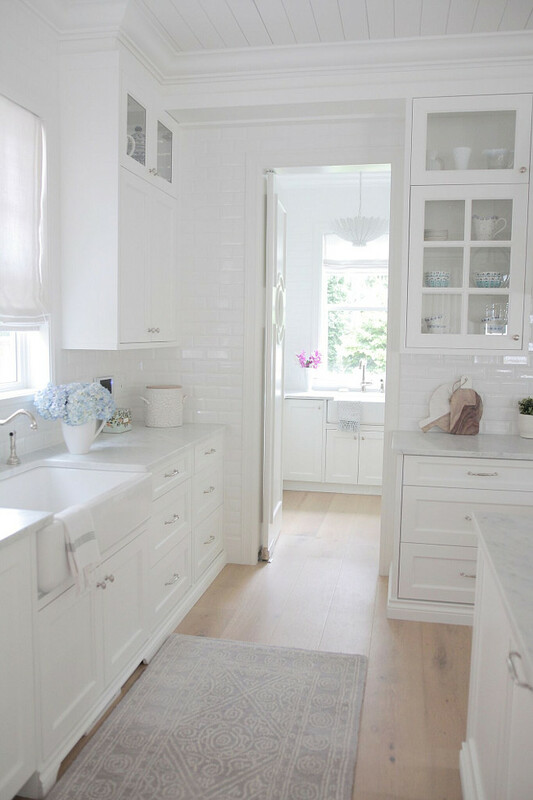 I wanted a light and airy feel to my house as all my other houses had dark cabinets and paint colors. I really enjoy the white as it’s clean and fresh. People always ask me how do you live with white cabinets and white walls with kids! 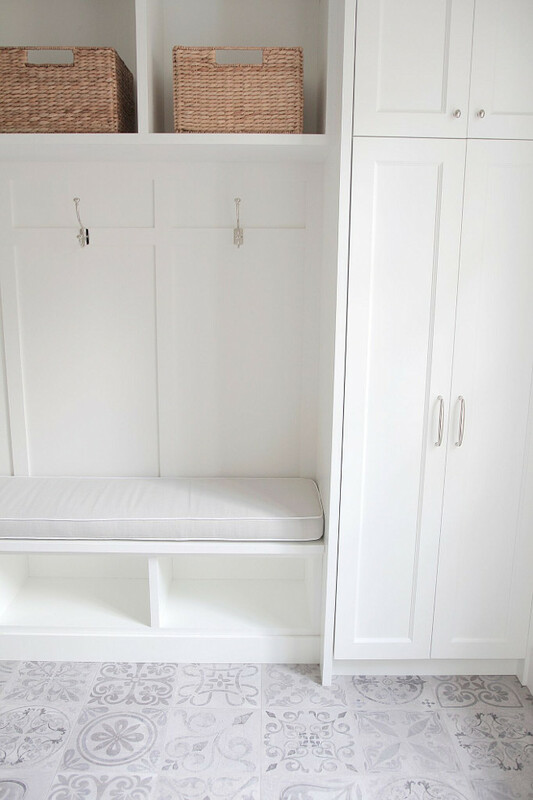 I think white is easier to keep clean. The dark cabinets in my old house drove me nuts as you can see every single hand print on them and the dark floors showed everything! 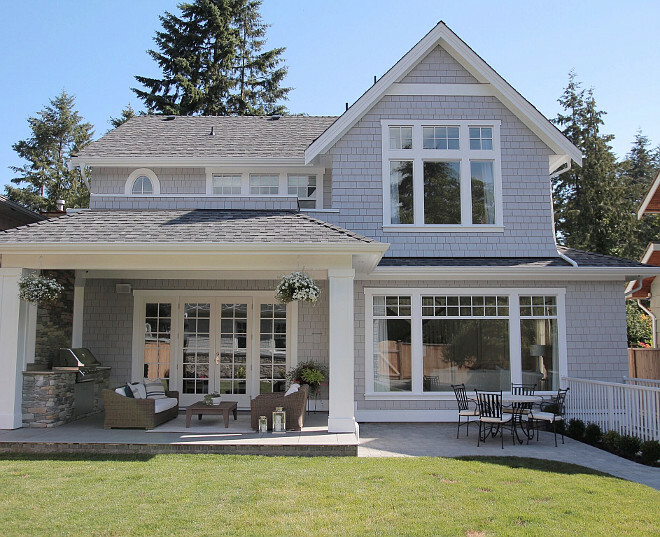 The exterior paint color is Sherwin Williams SW 3027 Driftwood. The homeowner used cedar shingles for siding. Besides Sonja, I think Charlie is also eager to meet you in the foyer! Hardwood floors throughout the house is Pravada Floors- Artistique Collection in Matisse. 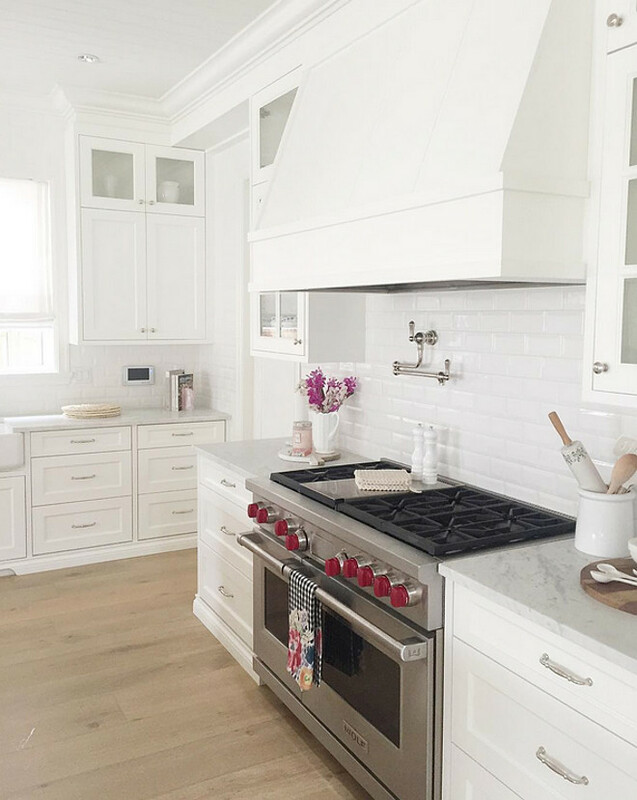 I fell in love with this kitchen! 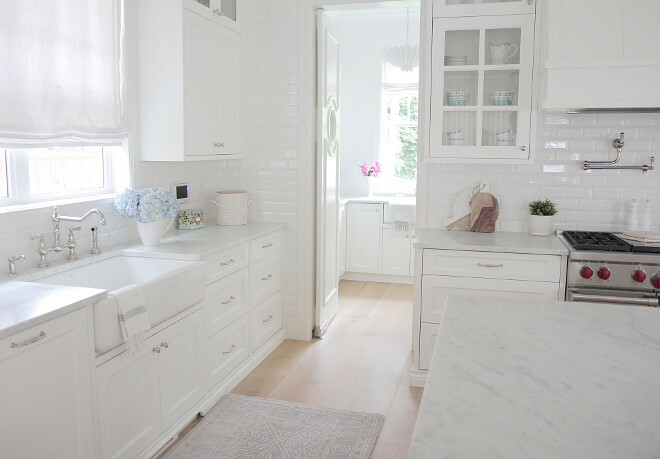 My last kitchen design was, in fact, inspired on this fabulous white kitchen. 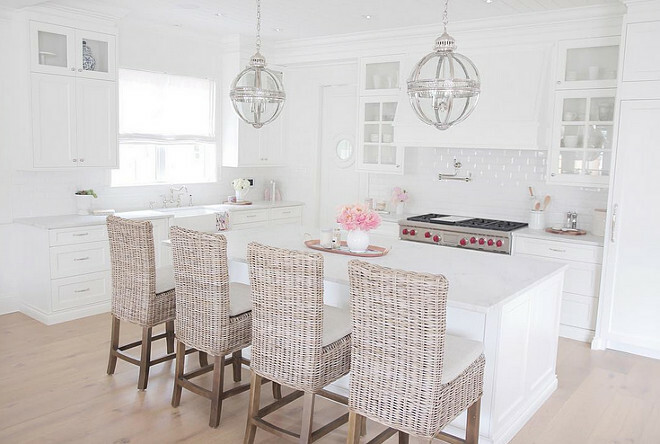 Most walls, ceiling and cabinets in this house, including this kitchen, are painted in Benjamin Moore OC-117 Simply White. 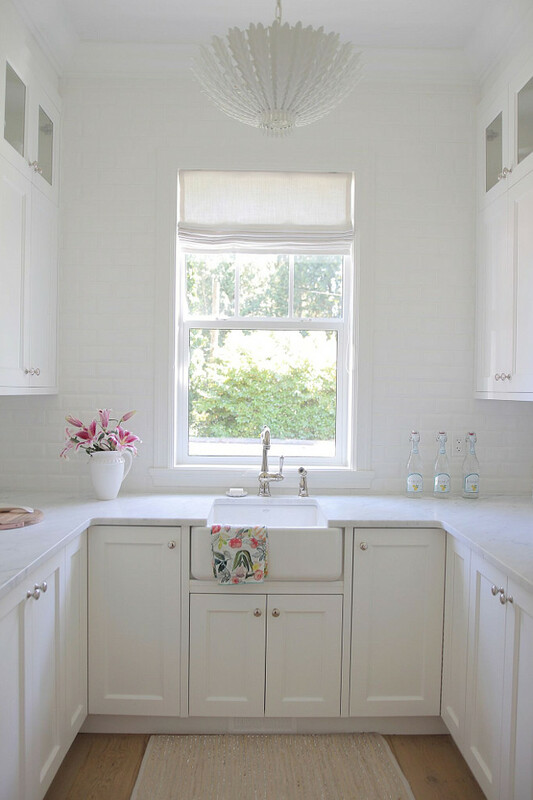 The kitchen features marble countertop; honed Bianco Carrara. 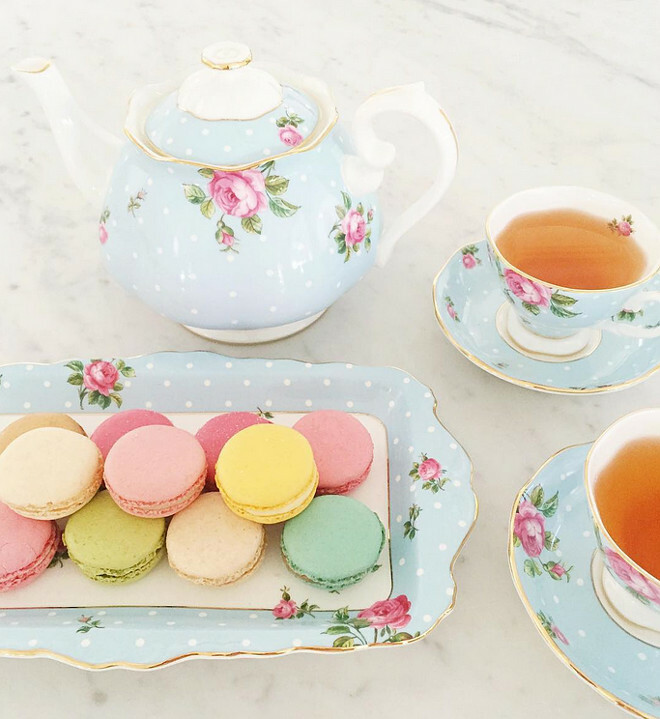 The homeowner celebrated Mother’s Day eating some macaroons over tea with her daughter. The tea set is by Royal Albert. Kitchen Lighting: Restoration Hardware Victorian Hotel Pendants – Small- Polished Nickel. 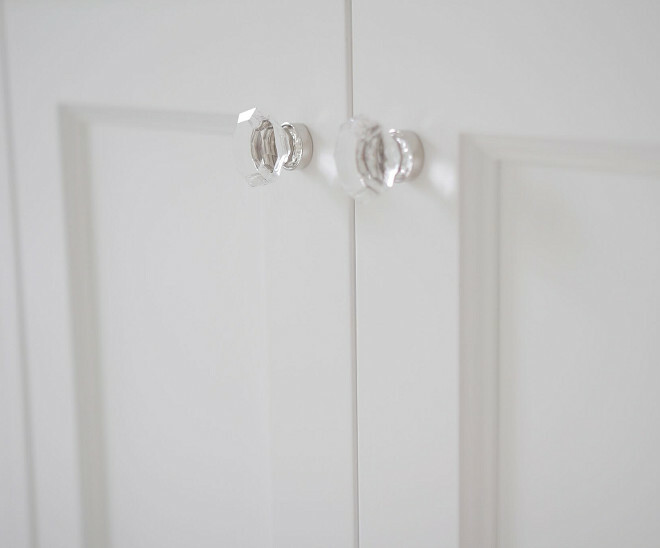 The cabinet hardware is Jeffrey Alexander – Tiffany Collection in Polished nickel – knobs & Refrigerator Pulls. Fridge & Freezer: Sub Zero. 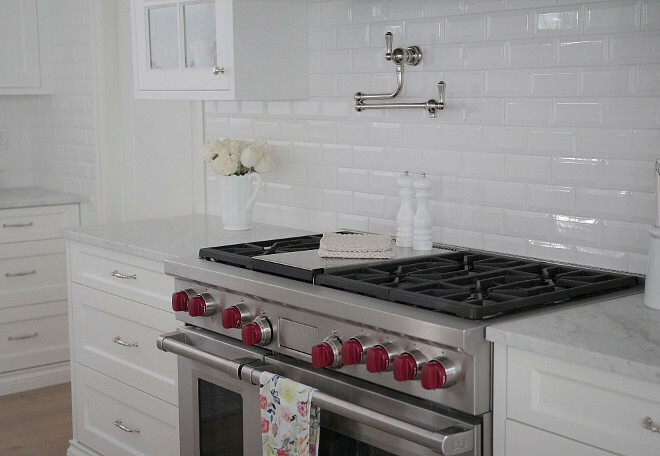 Pot filler is Rohl in Polished Nickel. 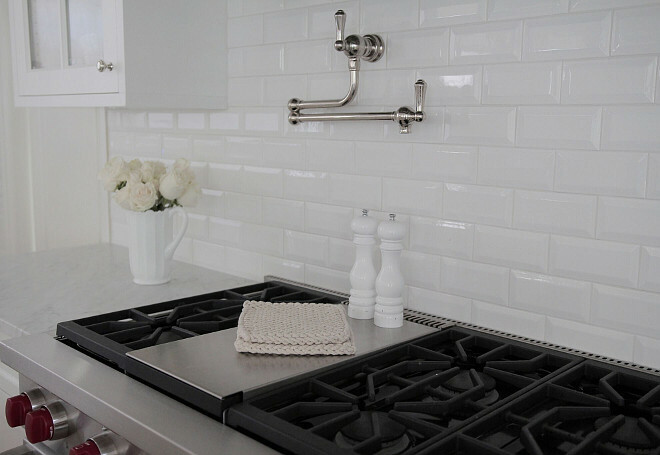 The backsplash is 3×6 White Beveled Subway tile – ANT- PLB186. Purchased through World Mosaics. 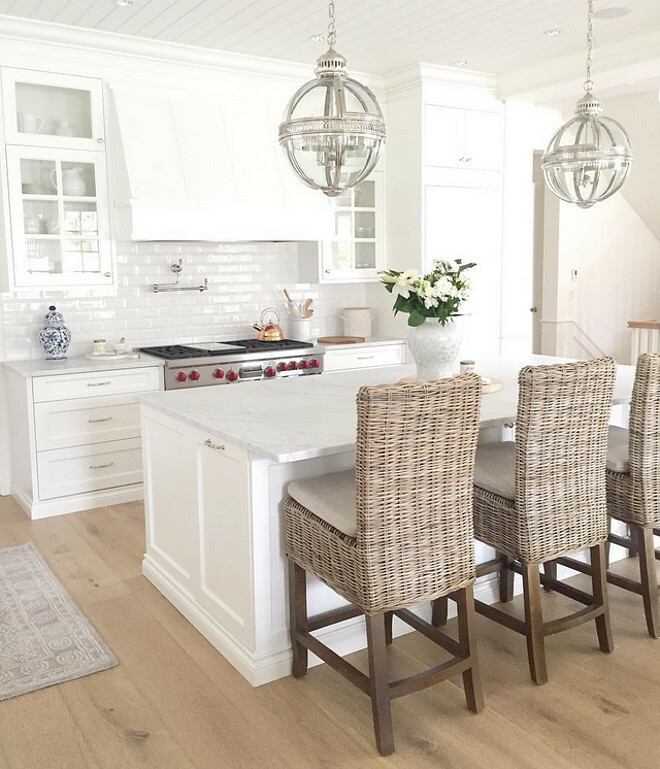 These wicker barstools, from Restoration Hardware, add texture and warmth to this crisp white kitchen. Great choice! Range is a 48″ Wolf. 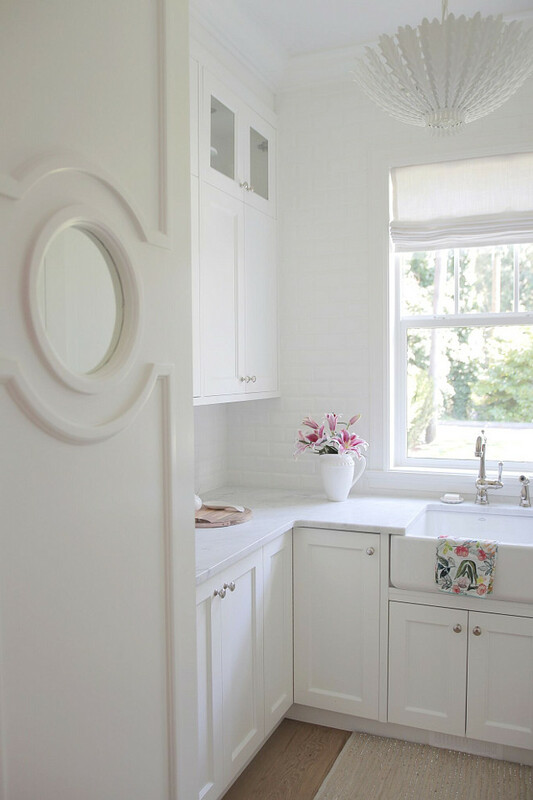 Many designers find Benjamin Moore OC-117 Simply White to be one of the best white paint color for cabinets. 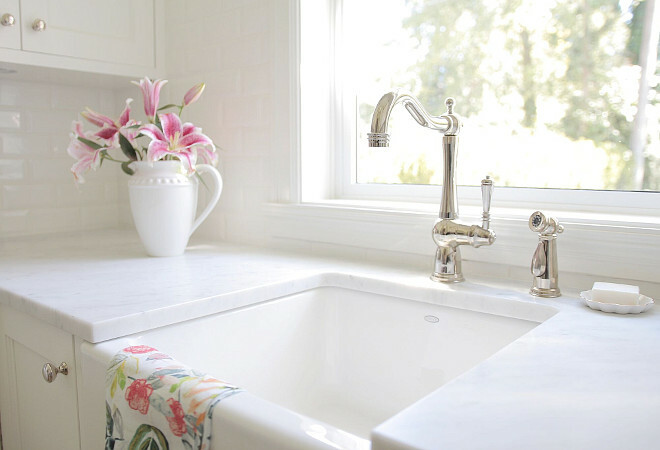 The kitchen features a Kohler Farmhouse Sink. 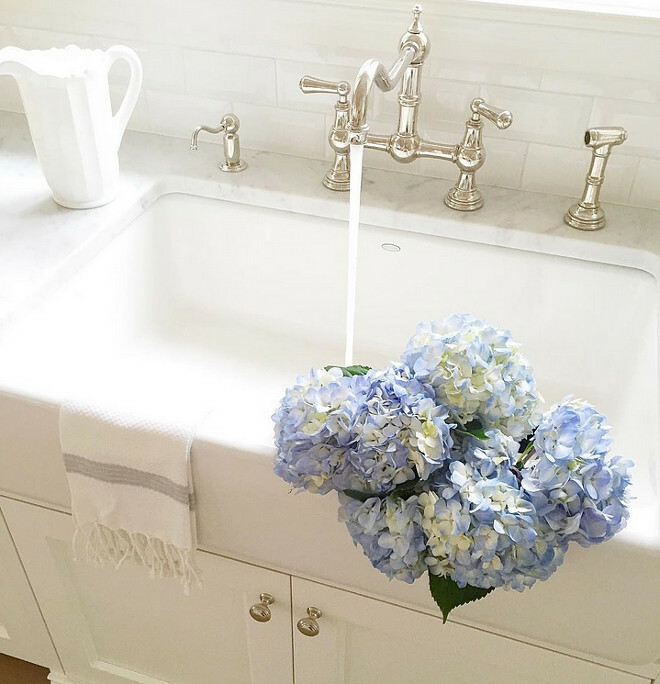 Blue hydrangeas add beauty and color to the kitchen. 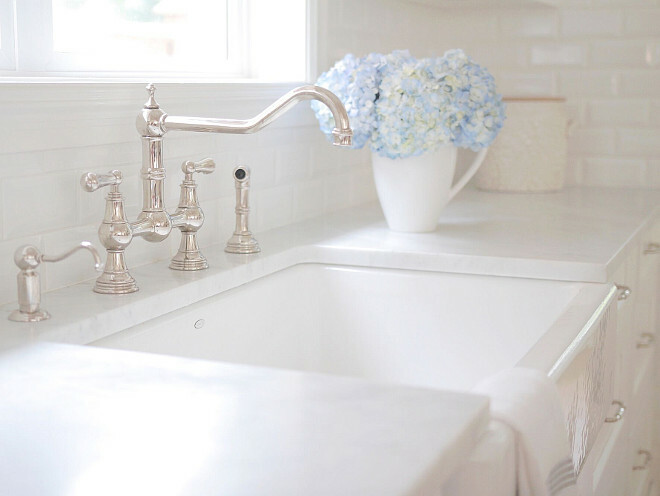 The kitchen faucet is Rohl in Polished Nickel. Who wouldn’t love to cook in this kitchen? It’s not only gorgeous but also very practical. The kitchen opens to a butler’s pantry. Notice the tongue and groove ceiling and trims. The pantry comes with a custom swing door with window. This is just too cute! 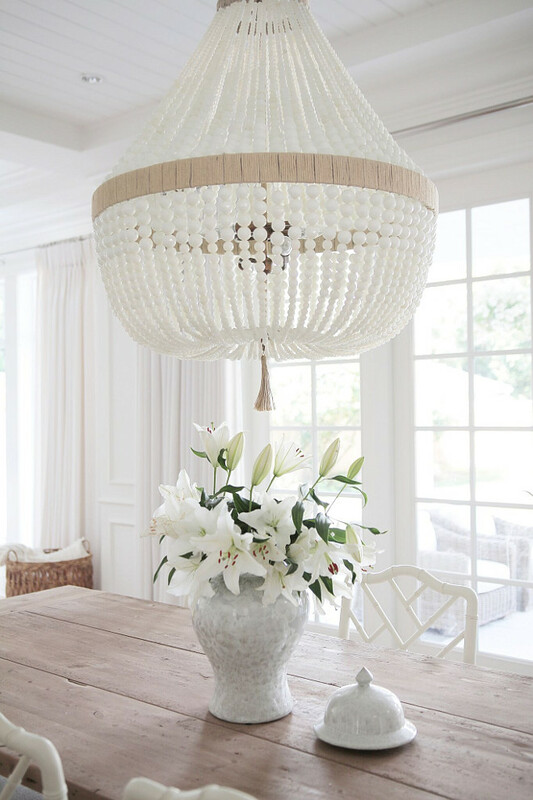 Pantry Lighting: Aerin – Hampton Large Pendant in Plaster white. 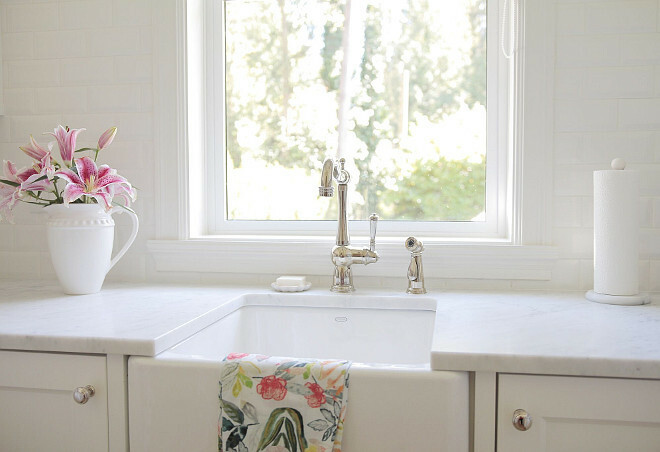 This small farmhouse sink is practical and beautiful. Sonja says that she prepares her coffee every morning here. 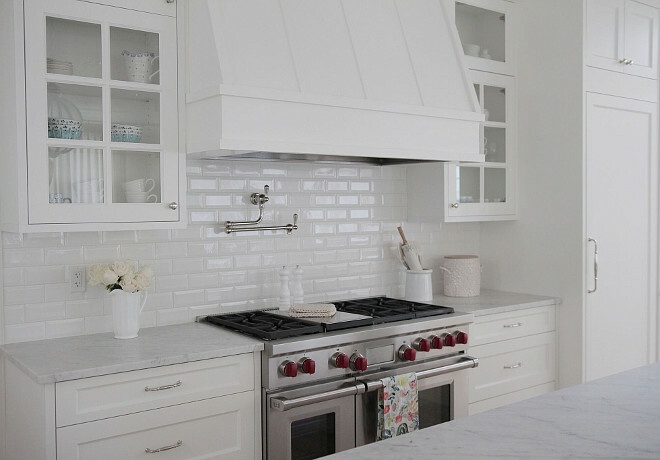 Beveled subway tiles were added from floor-to-ceiling on this wall. 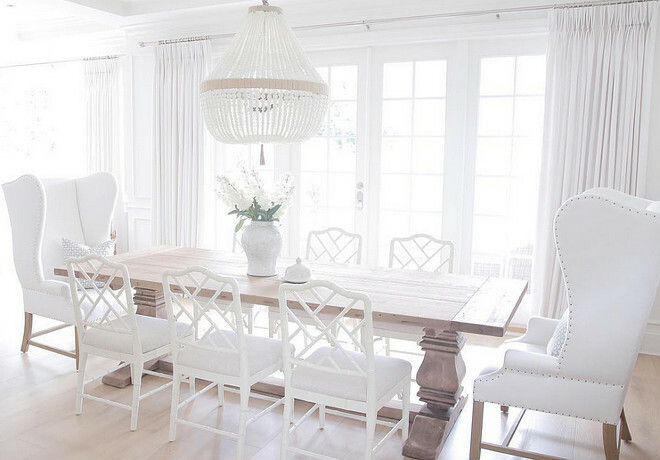 Bright, crisp and with personality, this dining room is truly impressive. The side chairs are Dayna Chairs in Rubbed Cream from Ballard Designs. 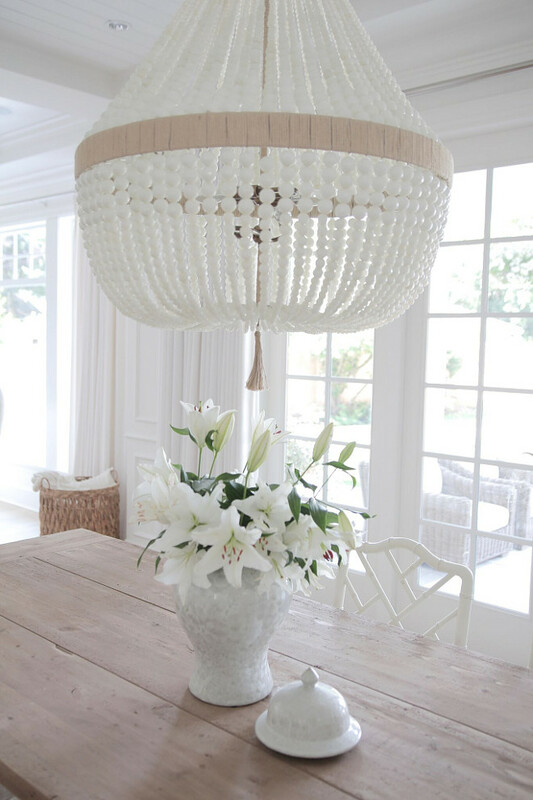 Dining room lighting is Ro Sham Beaux Orbit- White Milk beads. 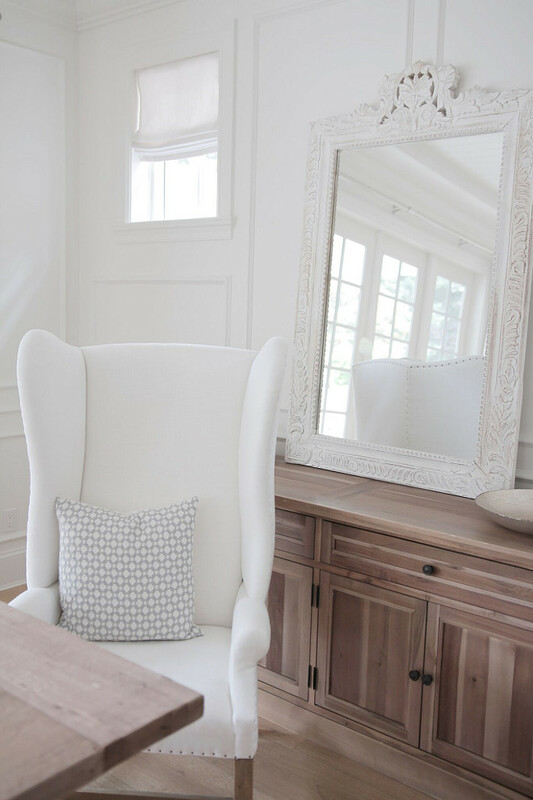 Host Chairs: Restoration Hardware – French Upholstered wing chairs- Belgian linen- white. Toss Pillows: Motif Pillows – Schumacher. The homeowner often display fresh flowers on her table. This is also my favorite way to decorate my dining room. Dining Table: Restoration Hardware Salvaged wood trestle table- 108” in Natural . 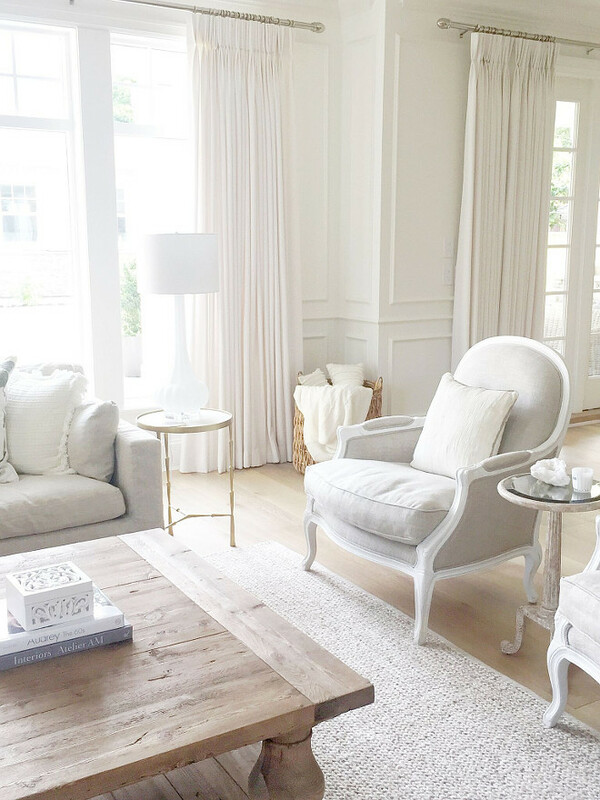 I love the neutral hues and textures found in this living room. 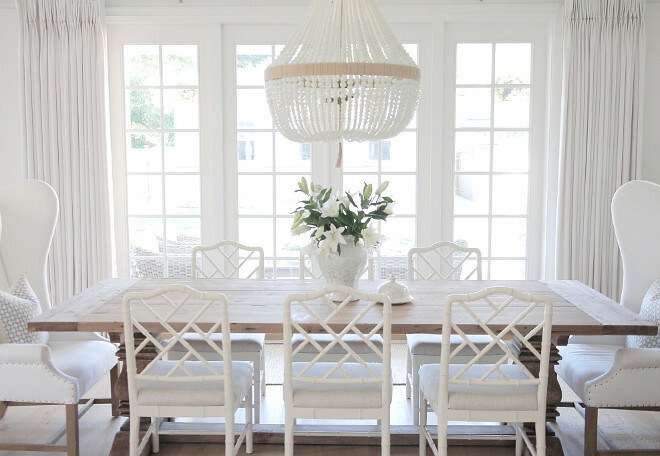 The chairs are Restoration Hardware Lyon Chairs- Belgian Linen- sand- Distressed white oak finish. 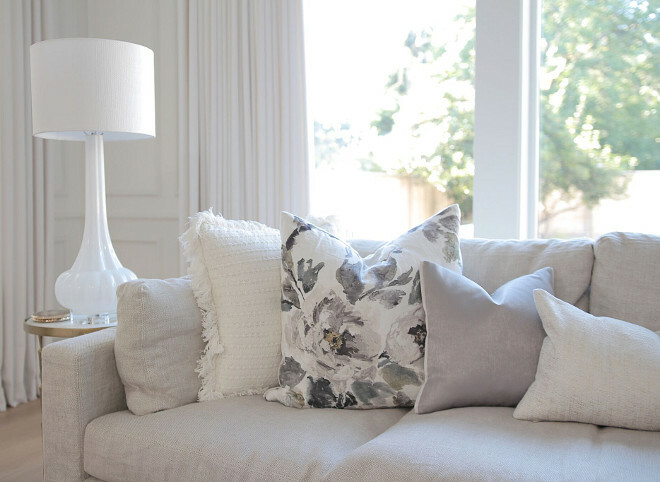 Sofas are from Restoration Hardware, Belgian linen, sand. Toss Pillows: Designers Guild – Shanghai Garden Ecru. Lamps: Horchow- White Rippled glass lamp. 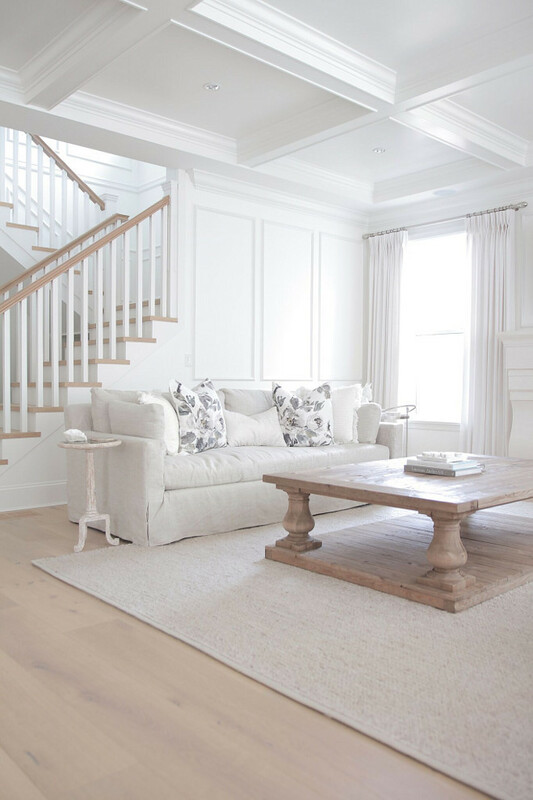 Softness and calmness are felt in this living room thanks to its neutral elements. 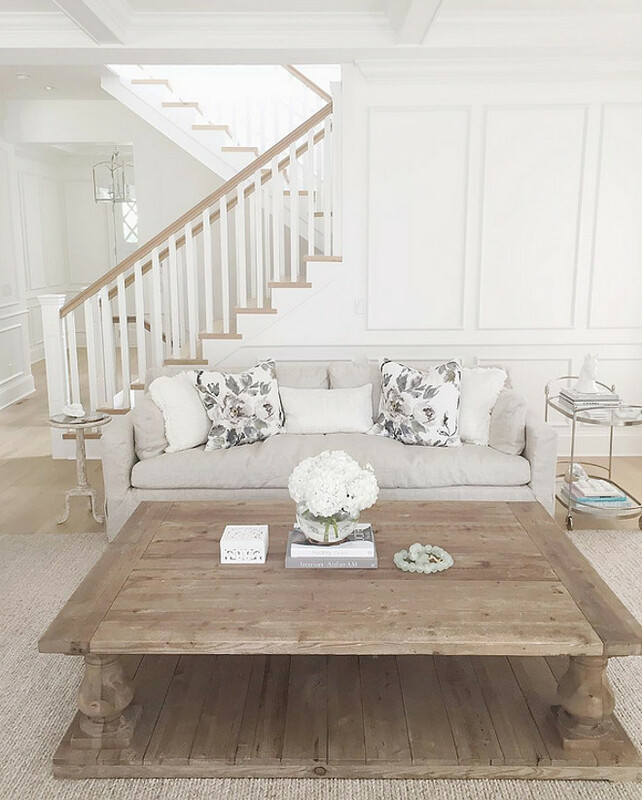 The coffee table is Restoration Hardware Balustrade Coffee Table – Natural. 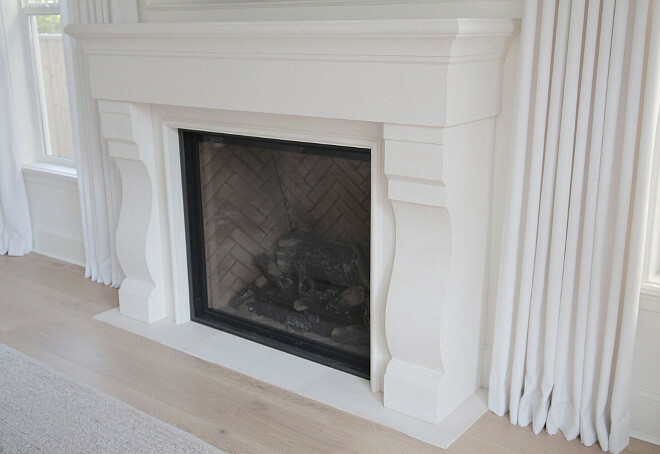 Fireplace Mantel: Custom-made from Lyonstone. 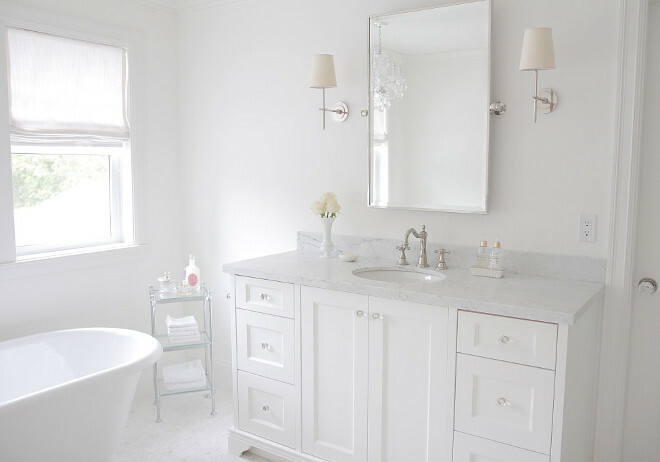 Paint: Simply White by Benjamin Moore. Rug is Restoration Hardware Braided rug- Marled color. Wood side table: The Cross Design. Drapes were done by Q design Centre – Linen- Winter White. The living room features traditional wall paneling and coffered ceiling. 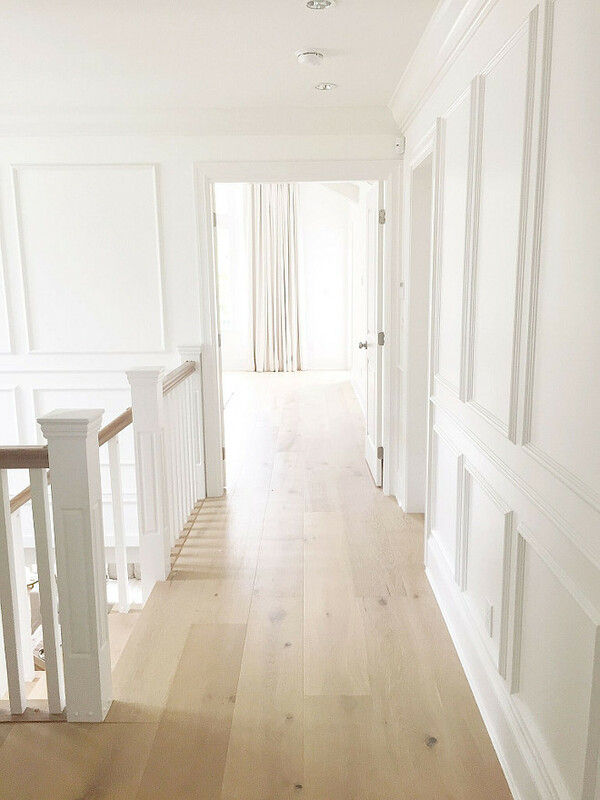 The upstairs hallway feature paneled walls and white oak hardwood floors. 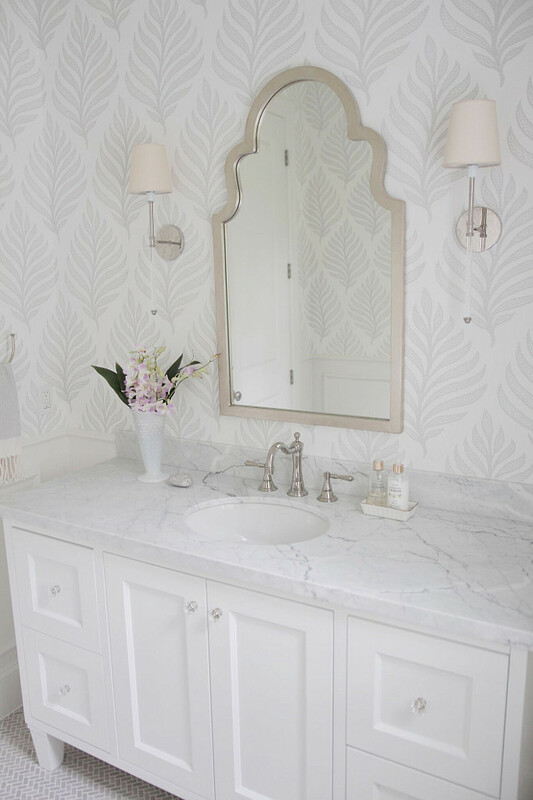 This beautiful powder room is all about the neutral wallpaper and that mirror. 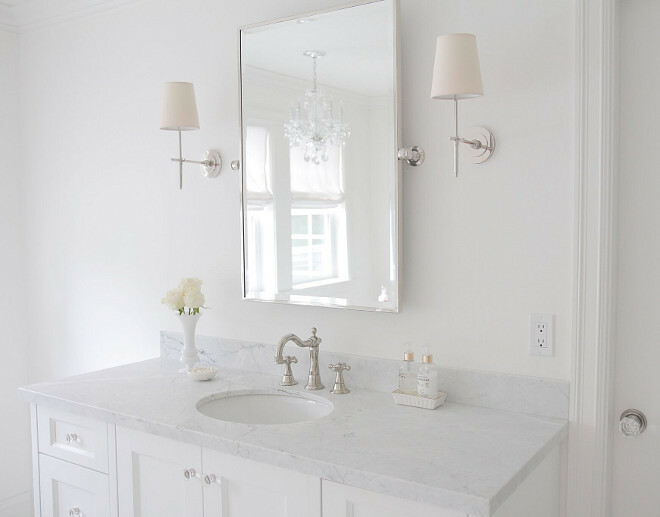 Sconces: Camille Long Sconce – Polished nickel – Suggested by Purity Designs. 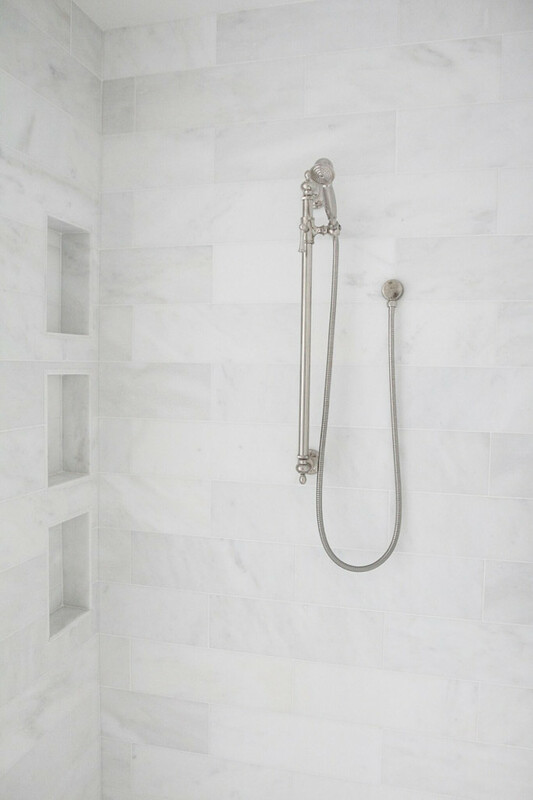 Marble Herringbone Floor Tile: Olympia tile – Suggested by Purity Designs. 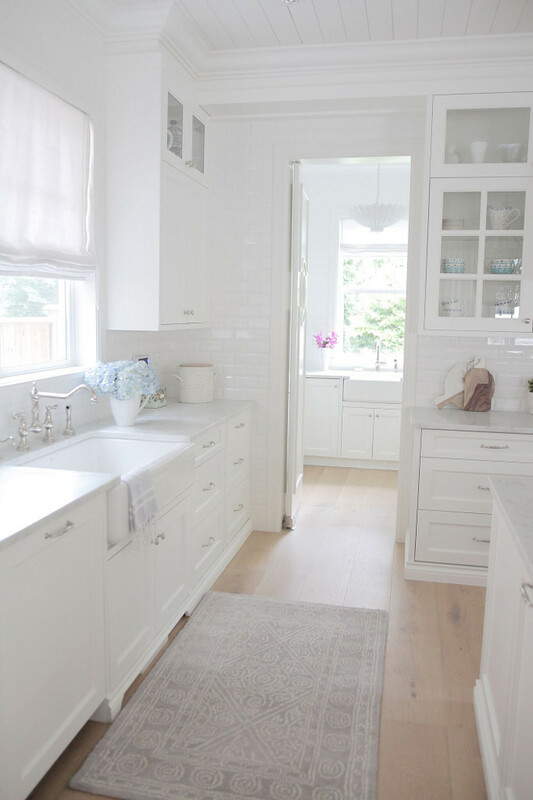 Countertop is honed Statuario marble. Soap tray is from Anthropologie. 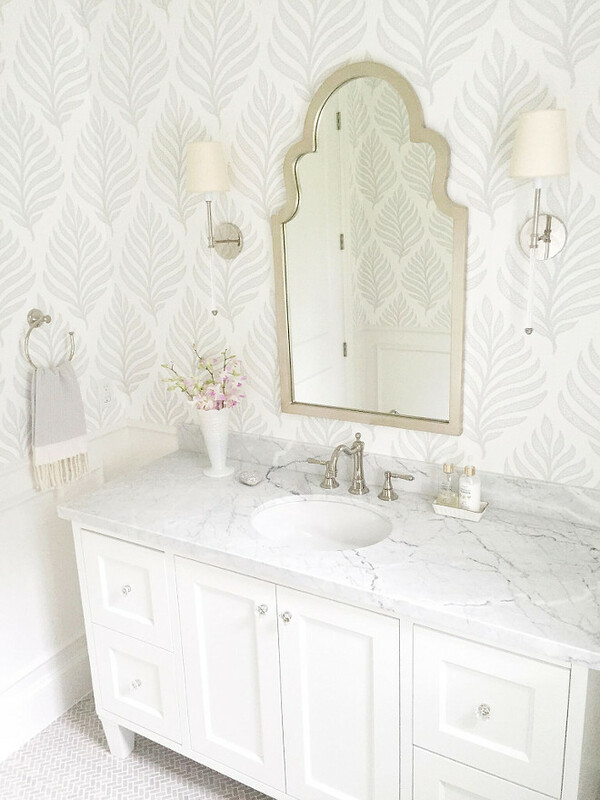 Wallpaper: Crown Wallpaper- Ordered through Purity Designs. I love how the homeowner designed her son’s room. Notice the wainscotting. Bed and bedding are from Restoration Hardware Teen – queen size. Wall paint color is Revere Pewter HC-172 Benjamin Moore. This bedroom is truly enchanting. 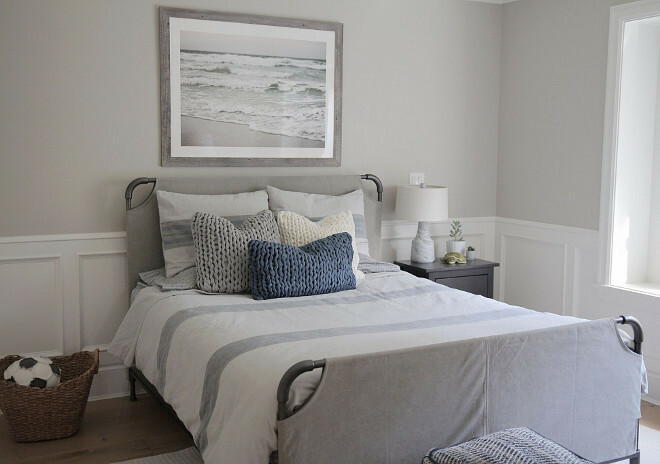 The room paint color is Benjamin Moore Simply White. Bed is the Alcott Hill in Twill White. Rug is the B01 braided rug from Rugs USA. Wallpaper is from Anewall Decor. 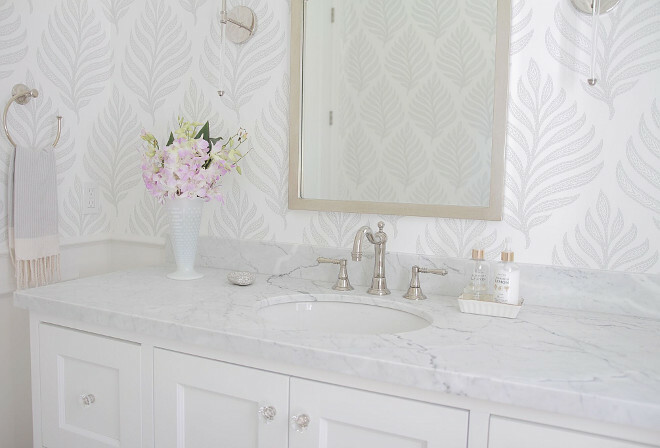 Wallpaper sourced by Purity Design. Decorated by the homeowner. The countertop is Quartz. 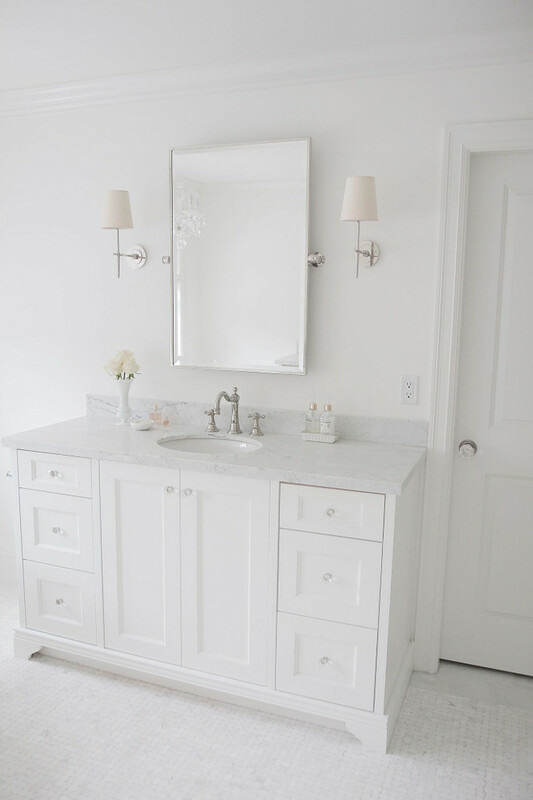 The homeowner looked for a white Quartz with no specks in it. 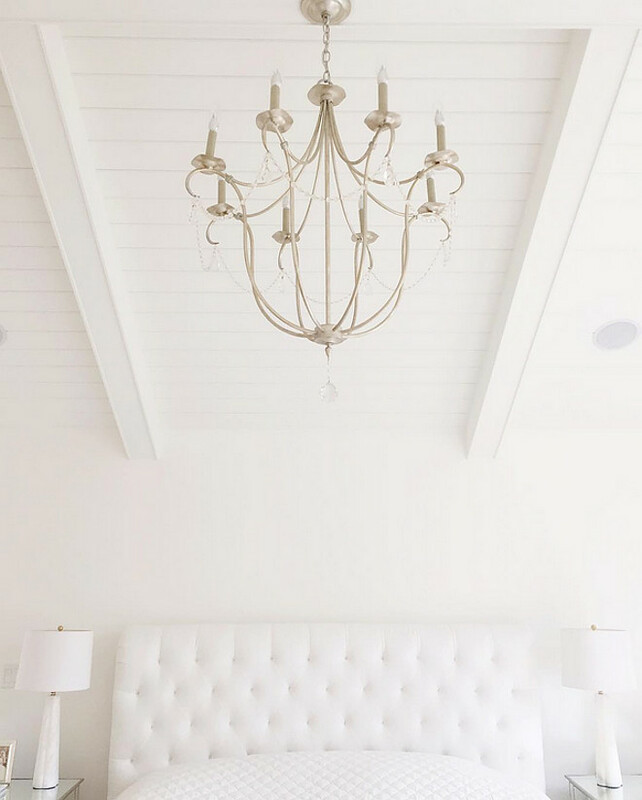 This master bedroom feels so peaceful… I love the vaulted ceiling with tongue and groove and beams. Chandelier is Currey & Co 9891 Silver Leaf. White Bedding: Duvet cover is from Pottery Barn. Pillows and shams are from Anthropologie. Bed is from Restoration Hardware. Wall paint color is Benjamin Moore OC-117 Simply White. 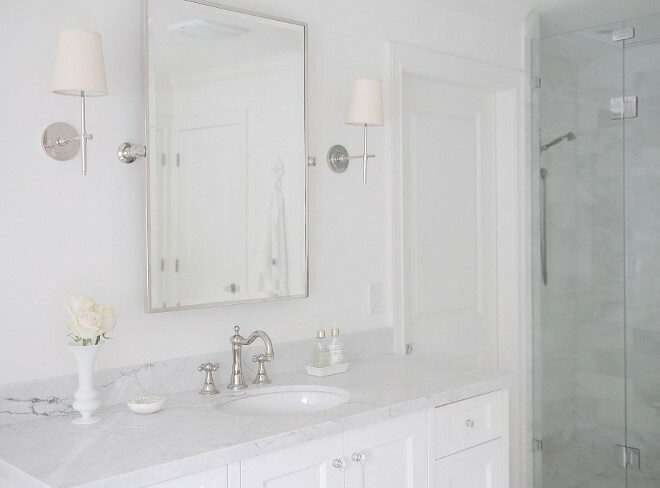 The master bathroom door features a glass door handle. Glass Door Handle: Emtek – Door handles – Old town clear knob – polished nickel. 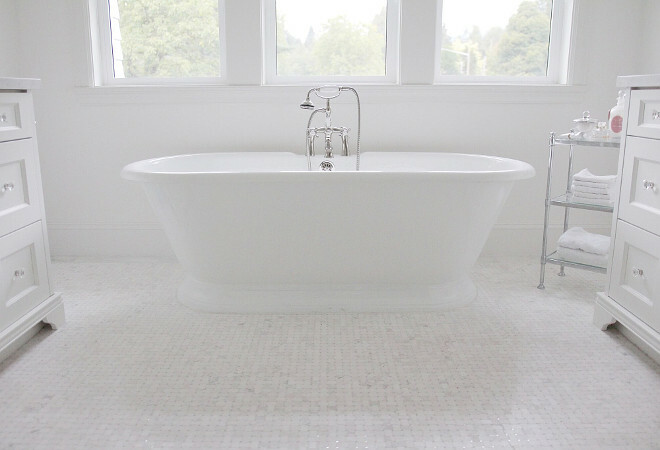 The master bathroom features two vanities and a freestanding bath below three windows with white line Roman shades. Roman Shades: Q-Design Centre- Linen in Winter White. Bathroom floor tile is Jeffrey Court Chapter 16- Metropolitan Grey #16510. 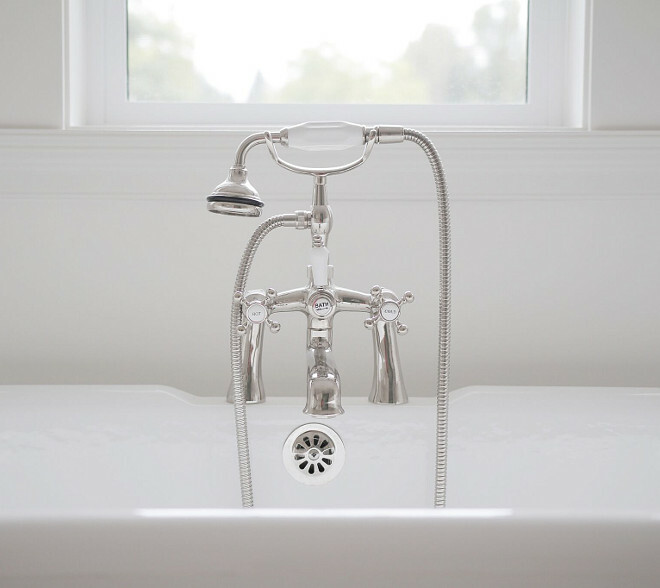 Tub filler is Cheviot Products Inc – Rim mount. Tub faucet in Polished nickel. 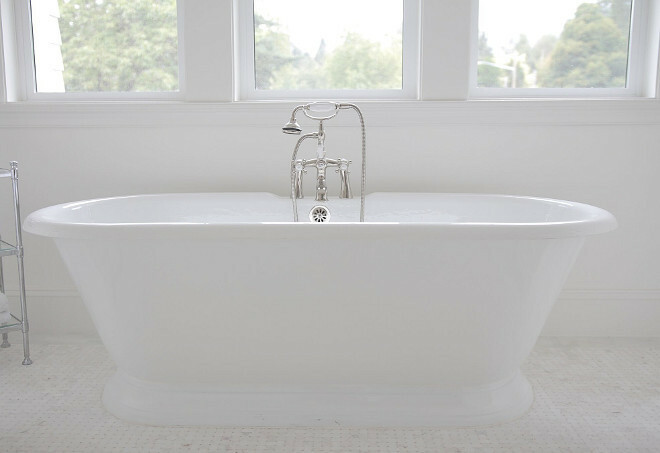 Freestanding Tub: Cheviot Products Inc – Sandringham cast iron tub. Mirror: Restoration Hardware Lugarno Traditional Mirror- polished nickel. Sconces are Thomas O’Brien, Bryant sconce – polished nickel- natural paper shade no trim. 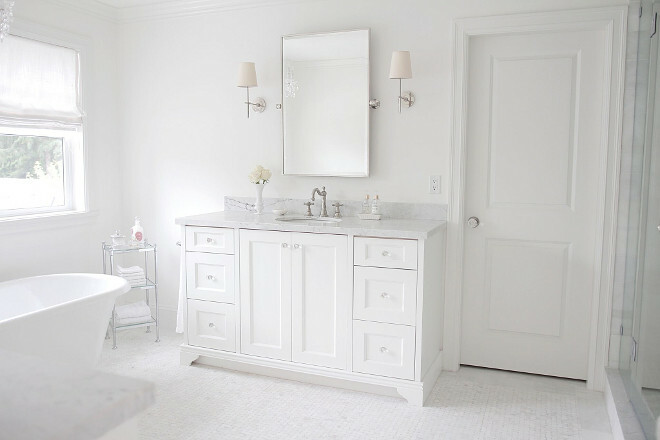 The bathroom wall and cabinet paint color is Benjamin Moore Simply White OC-117. 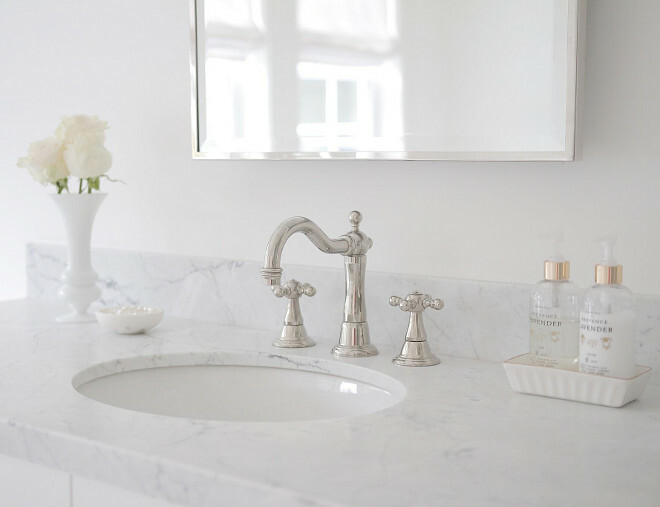 The vanity faucet is Brizo – Polished nickel. I love how bright this bathroom feels. 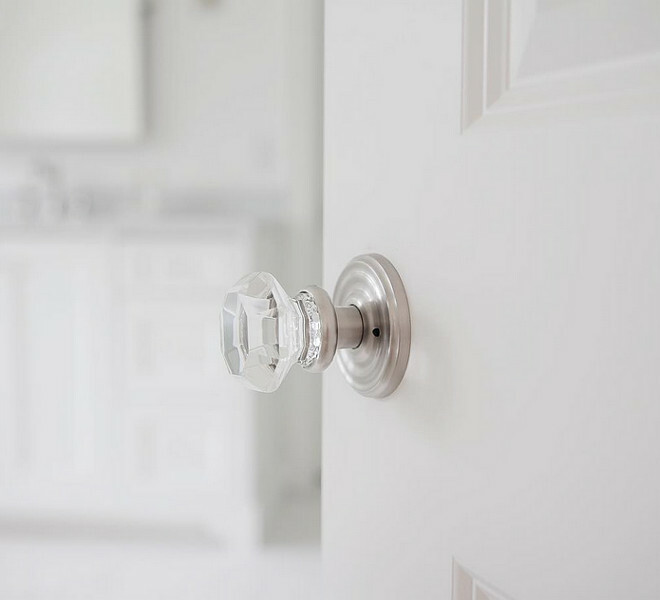 The cabinet hardware is Emtek – Old town clear cabinet knob – polished nickel. 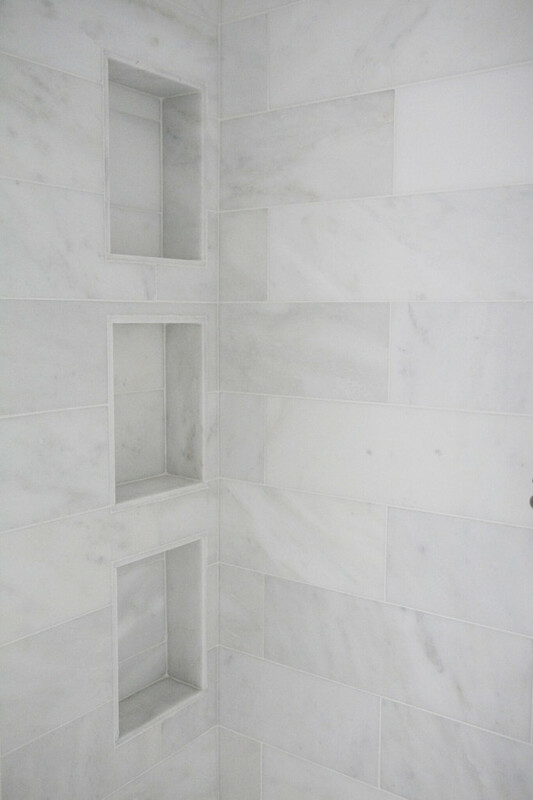 Shower walls feature 16×18 Statuario marble tiles. The shower feature three separate wall niches. 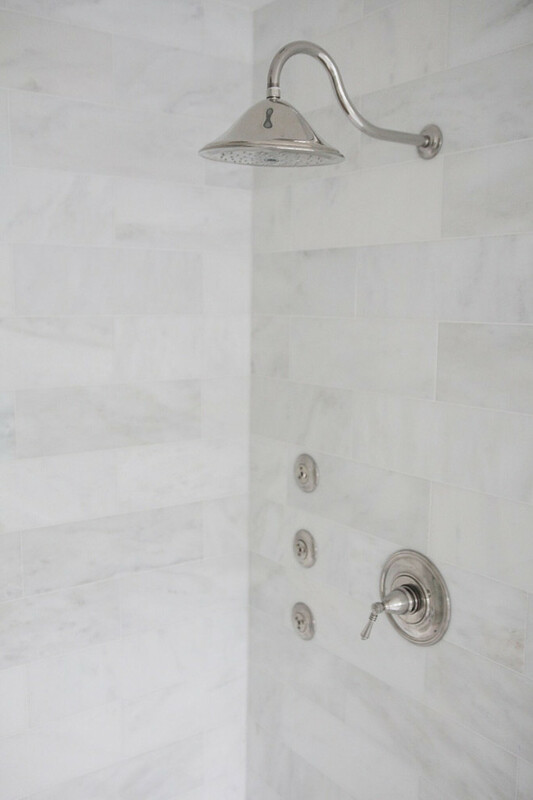 Shower faucet is Brizo – Polished nickel. 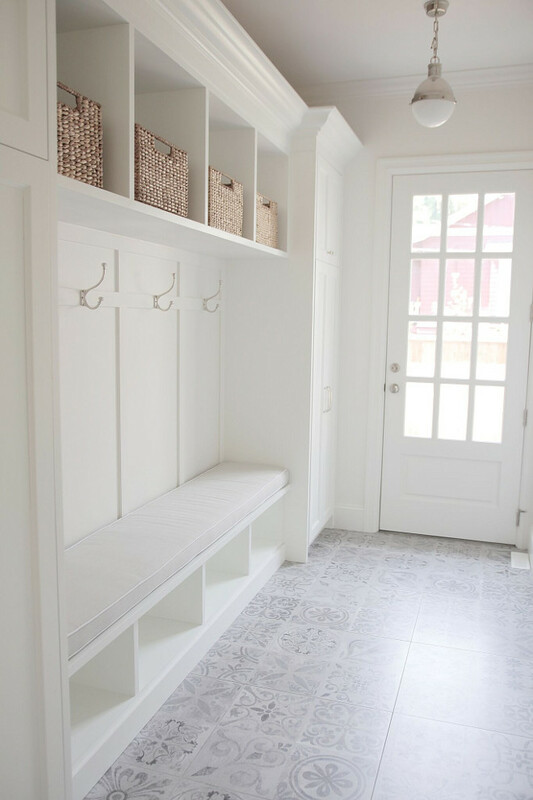 Everything was impeccably designed in this mudroom, but what really catches your attention is the flooring. Tiles are Fontile- Porcelain floor tile in Antique Acero color- 24×24. Lighting: Hicks pendant- polished nickel. Baskets are from Pottery Barn. Bench Seat Cushion: Q design Centre. Mudroom Hardware: Restoration Hardware Ephram- Knob, handles, and hooks. 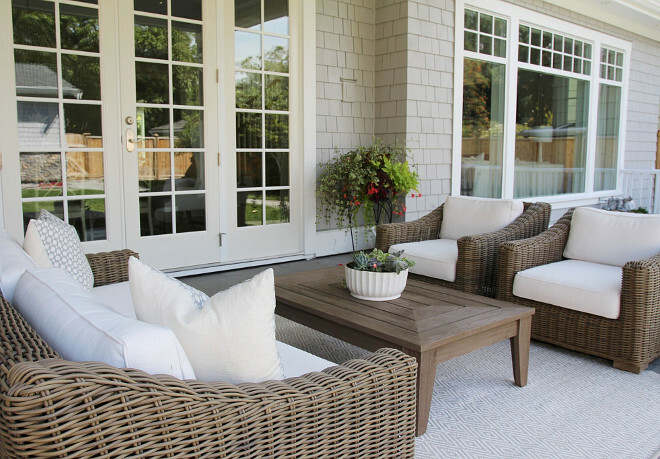 The patio furniture is from Restoration Hardware. Coffee table is the Cannes coffee table. The patio and front entryway floors are granite. 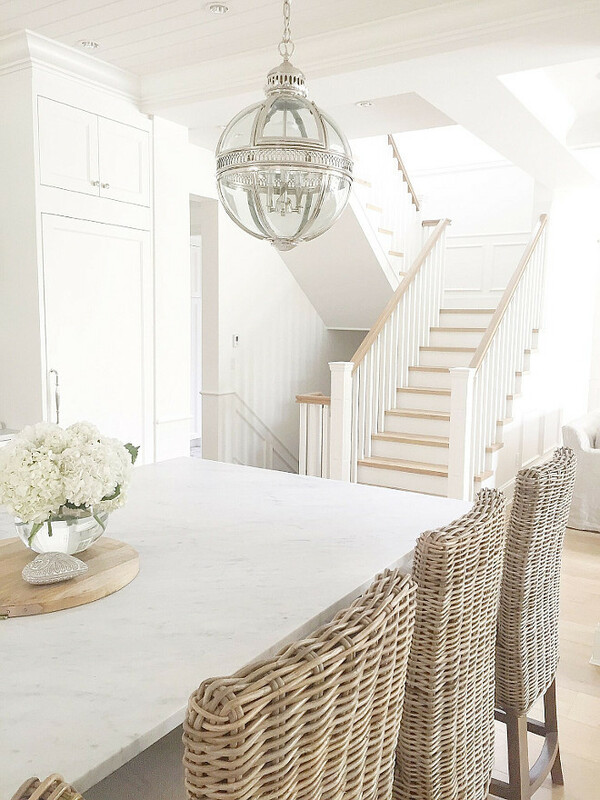 Make sure to follow Sonja from jshomedesign on Instagram to see more photos of her beautiful home! Interior Design Ideas: Transitional Home. thank you. 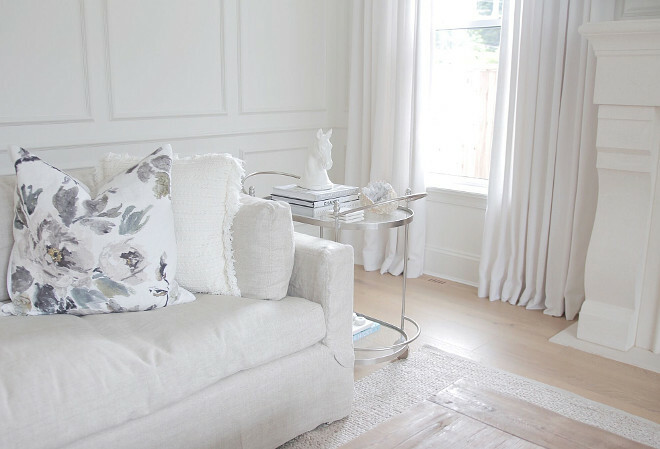 Great post, lovely and sophisticated home. I don’t do Instagram so am very pleased you are going to showcase it on the blog. 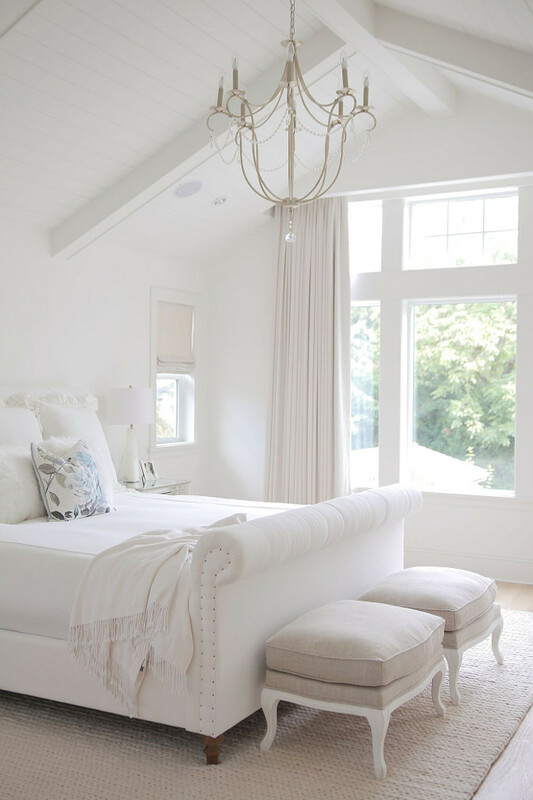 Gorgeous all that white makes me happy…..love it! Love that wallpaper. I went on Crown Wallpaper website but couldn’t find this pattern, literally looked through each design. Can you please share the manufacturer if you know? Thank you so much! 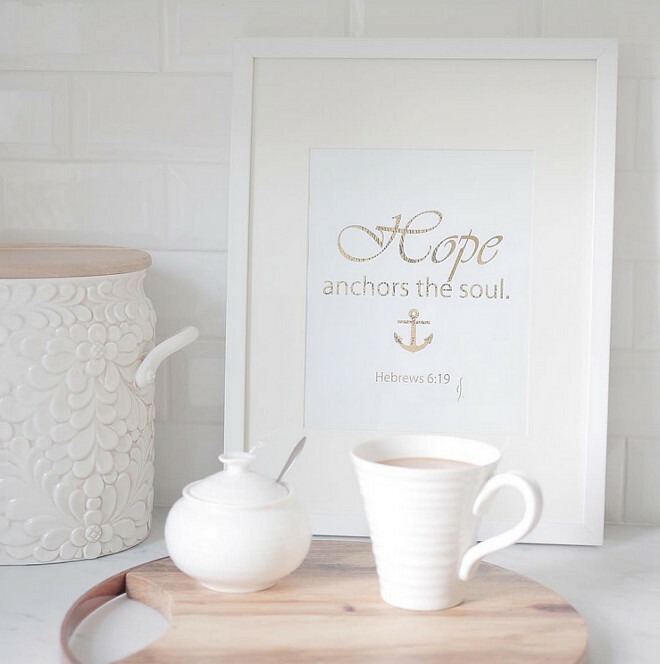 I am also searching for this Crown Wallpaper print…any ideas on a way to find it?? This home is absolutely lovely. Would you be so kind as to share the color of the roof shingles? Thank you! Live this house. We are currently designing an extension on a period home. Wondering if you have a floor plan for this house. 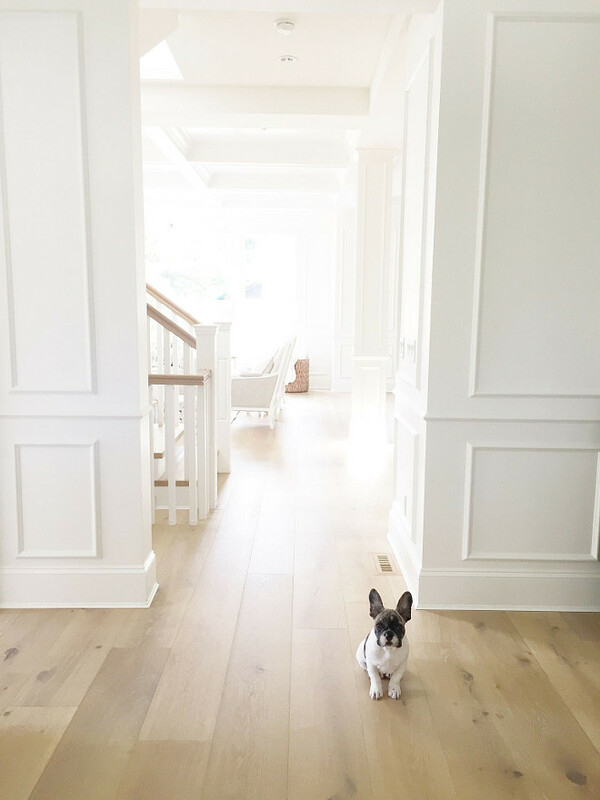 The white oak floor is gorgeous. This is what I’m hoping for. 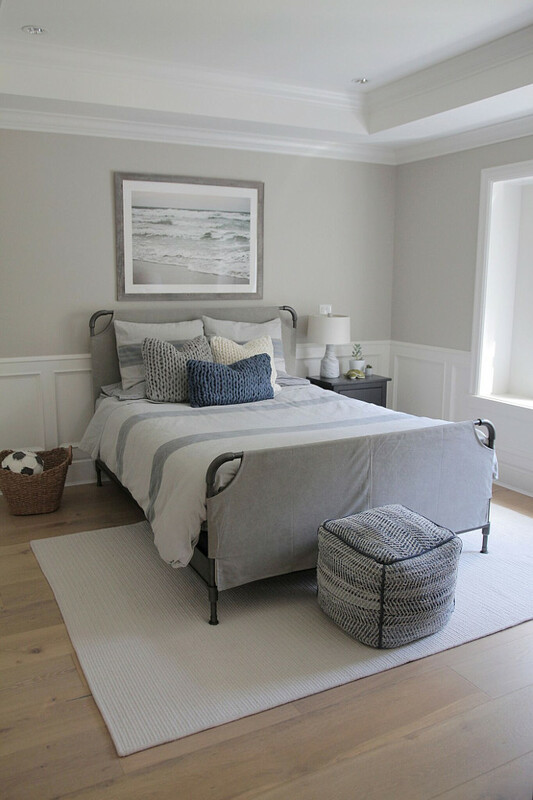 Where are the curtains from in the master bedroom? Color? Absolutely stunning house. Most importantly, thank you for sharing all the resources! It is beyond helpful when trying to make so many decisions. Thank you so much for taking the time to leave this kind comment, Janet. I really appreciate it! Love the wallpaper. I went on Crown Wallpaper website but couldn’t find this pattern, literally looked through each design. Can you please share the manufacturer?